Home / News / Stories / Viral / Nagtaka ang Babaeng Ito Matapos Makitang Malinis Ang Libingan ng Kanyang Anak. Napaluha Ito Nang Malaman Kung Bakit. Nagtaka ang Babaeng Ito Matapos Makitang Malinis Ang Libingan ng Kanyang Anak. Napaluha Ito Nang Malaman Kung Bakit. It was never easy to accept that one of your loved ones had already died. Death was never an easy thing to cope with and just like how the saying goes, no parent should have to bury their child. However, for the family members of people risking their lives to serve their country, it has been a part of their lives to worry about their children’s safety. The worst part is the fact that you’d have to wait for your child to come home, only to find out that they’d arrive in a casket. The United States Air Force Staff Sergeant Joseph Villasenor died at the age of 36. His death left his parents devastated but also, short life after his death, his parents were able to witness the best thing in life. For sixteen years, Joseph Villasenor served his country but in 2010, he died tragically. One day, his mother, Rachel Villasenor paid his grave a visit at the Garden Park Cemetery in Arlington, Texas. However, during her visit, she noticed something strange. 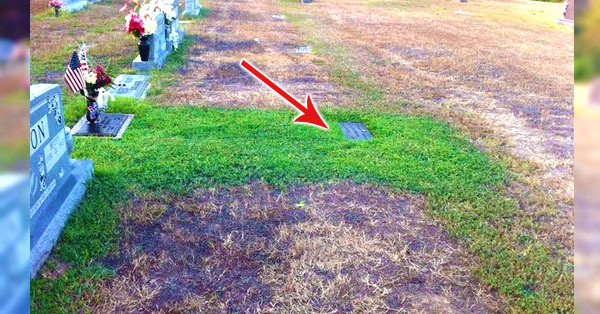 Almost all of the other graves around his son’s grave was covered with dirt and dead grass, but his son’s grave was magically filled with clean and healthy grasses! They thought that this was some sort of a miracle, but later on, they learned something that left them in tears. It turns out that one encounter had changed their lives. One day, the 86 years old Jake Reissig was visiting his wife’s grave. They were married for 65 years and were blessed with nine children, however, his wife died. Ever since he lost her, he decided to stick with her every single day to make sure that her grave will be healthy. He had a daily routine that time. First, Jake has to go to the church every morning, then he’d have coffee with one of his children. He will then return to his home and clips beautiful roses from their garden before going directly to his wife’s grave. However, there was this one day that he noticed something that he had never seen before. When he visited his wife’s grave, Jake saw a woman who was sobbing by a gravestone nearby. He then went over to comfort her and later on, he discovered that it was Joseph Villasenor’s sister. He knew that he couldn’t replace the loss of their family member and so when he left the cemetery, he promised himself that he would do something to brighten up the life of Joseph’s family. Each day that he visits his wife, he would water his wife’s grave and would go to Joseph’s grave to water it as well. The day has come, Rachel and her husband paid their son a visit and to their surprise, they were welcomed by a green grass!